Ahead of their World Football Challenge match against Real Madrid at Yankee Stadium, Italian club Associazione Calcio Milan, better known as A.C. Milan, will be stopping by the adidas NYC Store next Tuesday. Ahead of their World Football Challenge match against Real Madrid at Yankee Stadium, Italian club Associazione Calcio Milan, better known as A.C. Milan, will be stopping by the adidas NYC Store next Tuesday. Players will engage in a meet-and-greet with fans and sign autographs for guests in attendance. 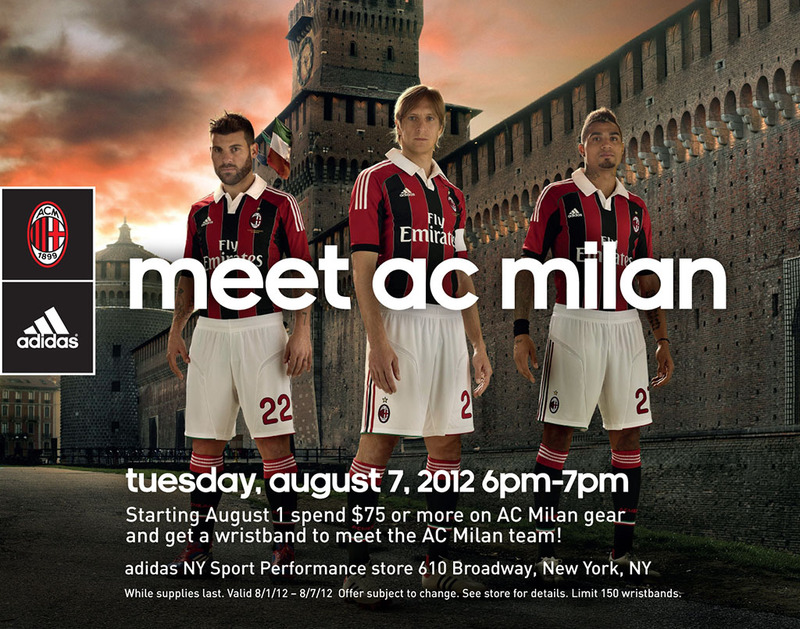 Starting today, the first 150 fans to purchase $75 or more of AC Milan gear at the adidas Store will get a wristband that guarantees access to meet the team. The event starts at 6:00 p.m. EST and runs until 7:00 p.m. View the flyer below for more information. Real Madrid and Milan square off next Wednesday at 8:00 p.m.